Known for the Cleanest Porta Potties in the Hudson Valley. Herring Portable Toilet rental costs include delivery, set up, pick up, paper products, chemicals, cleaning once per week. How many units will I need for my event? Herring uses an exact formula so you have enough units for what you need but don’t have to pay for more than you’ll use. Contact Herring Sanitation and give us the number of hours of your event and the number of anticipated guests and we can give you the correct number of units you will need to ensure you have comfortable clean portable toilets for the entire event. When will the units be delivered? Herring Portable Toilet delivery men try to deliver the units the day before the event so we don’t conflict with any of your other deliveries or put stress on you the day all the activity is happening. Generally Herring will pick up the unit the Monday (or the day) after the event. How far in advance do I need to place an order for a unit? Herring mans its office Monday through Friday and ½ day on Saturday. So you can call anytime, even last minute, but we love at least a day’s notice. But we suggest you schedule it in advance so it takes the stress off your last minute planning. We’ll make sure it’s delivered as you request. How often are the portable toilet units cleaned? Generally, Herring cleans your portable toilets weekly. We will design a schedule of cleanings to meet your needs if you have heavy use. If you would like additional cleanings per week, of course there is an additional charge for this service. What is minimum rental time? Can I rent a portable toilet for 1 day? You can rent a portable toilet for a single day. How does Herring keep the water in the portable toilet from freezing during cold weather? Herring uses a non-toxic solution to keep the water in your portable toilets from freezing during below freezing temperatures. Do I need to supply water for the portable toilet and sink units that have running water? No. Please keep in mind, none of the water supplied by Herring in the portable toilets and portable sinks is potable. Do I need to supply electricity for the portable toilet units? Herring does not require you to supply electricity for portable toilets, portable sinks. However, if you are renting our Luxury Portable Restroom, it comes with 12v power but if you want to use the air conditioner, electricity would be necessary. Where can you place my portable restroom? Herring can position the portable toilets and portable sinks anywhere you like, as long as it is within 15-20 feet of where the delivery truck can access. Herring will require damaged or stolen units to be repaired or replaced at client expense. However, Herring will take care of any cleanup necessary in these instances. There may be an additional cost for these cleanups. Federal ADA regulations are followed regarding size and accessibility. See the 2010 ADA Standards for Accessible Design document for more details. All Herring ADA portable toilets are guaranteed to comply with all current regulations, as required by law. Do I need a hand washing station? You are not required by law to have a hand washing stations unless you are serving food on site. A hand washing station or portable sink is recommended if you choose a unit that does not include sink or hand sanitizer. Is it safe for my child to go into a portable toilet unsupervised? If a child is young enough to try to climb into the potty, there is a drowning risk as the tank holds 5 gallons of water. However, if you are asking if there is a risk of chemical toxification with children, there is no risk. 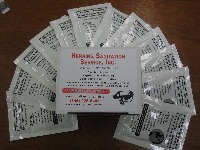 Herring uses a non-toxic deodorizer in all of our portable toilets.